When the seeds are too dry during harvest, they are too delicate and will give less profit. An option is to increase the moisture content of the seeds. It is important that this is carried out correctly. Ensure the supplied moisture is absorbed well by the seeds, and the desired moisture content can be controlled. The simplest humidification method is to press air, in the form of very fine mist, through the seeds using an (ultrasonic) humidifier. In this case the problem is that the water is not really absorbed by the air, but float through the air as drops of water. However small the drops might be. This is comparable to mist; you get wet because the drops of water fall down on you. This way, the seeds, mostly at the supply side, will also become wet on the outside. Only over time the seeds will absorb the moisture. This can be harmful for the seeds and leads to an irregular seed moisture content. When you use the humidification equipment of Agratechniek, the moisture would be absorbed by the air. There will be no more drops of water in the air. The Absolute Moisture content (AH: absolute humidity, grams of water per kilogram of air) will then rise. The seed humidification process will take place inversely to to the drying process; the dry seed wants to be in equilibrium with the more humid air. The seeds absorb the moisture from the air without the seeds becoming humid. Humidifier in closed cell with internal circulation. Our humidification equipment enables correct control of the desired air AH. It increases the seed moisture content to the desired moisture content in a controlled manner. By relating the AH of the ingoing air to the AH of the outgoing air (Delta AH), the moisture content in the entire box will increase evenly. This prevents the supply side from becoming to humid in relation to the seeds where the air exits. Seeds that absorb moisture slowly (beans), will have a lower Delta AH than seeds that absorb moisture faster. 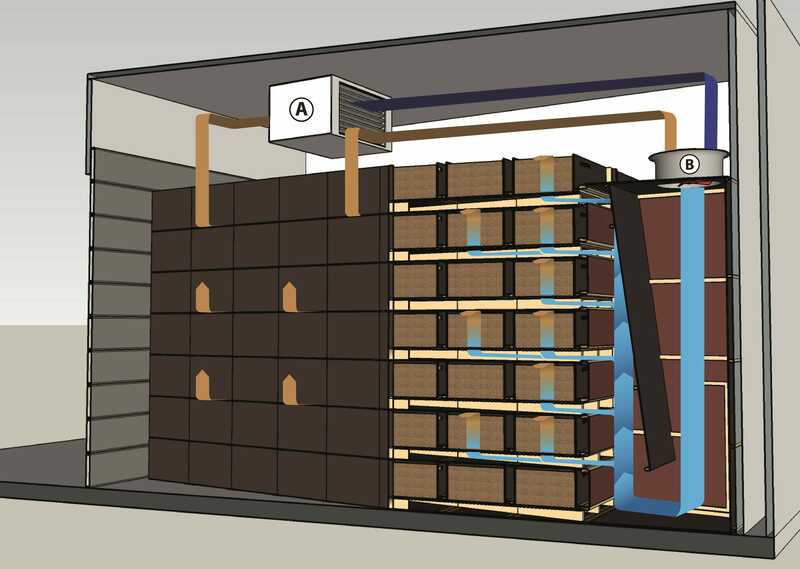 The humidification process is recommended in a closed space. In this case, the moisture content in the space can be brought to the AH value where the seeds can reach the desired equilibrium moisture content. 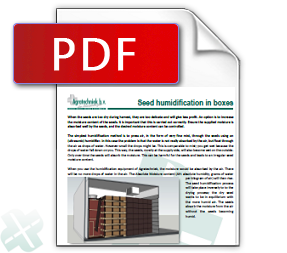 You can opt for an installation with only humidification, or a combination including a seed drying option. Ventilation system with integrated humidification and drying option. During the humidification process, the humidifier blows humid air to the air distribution system. At that system the humid air is blown through the seeds. 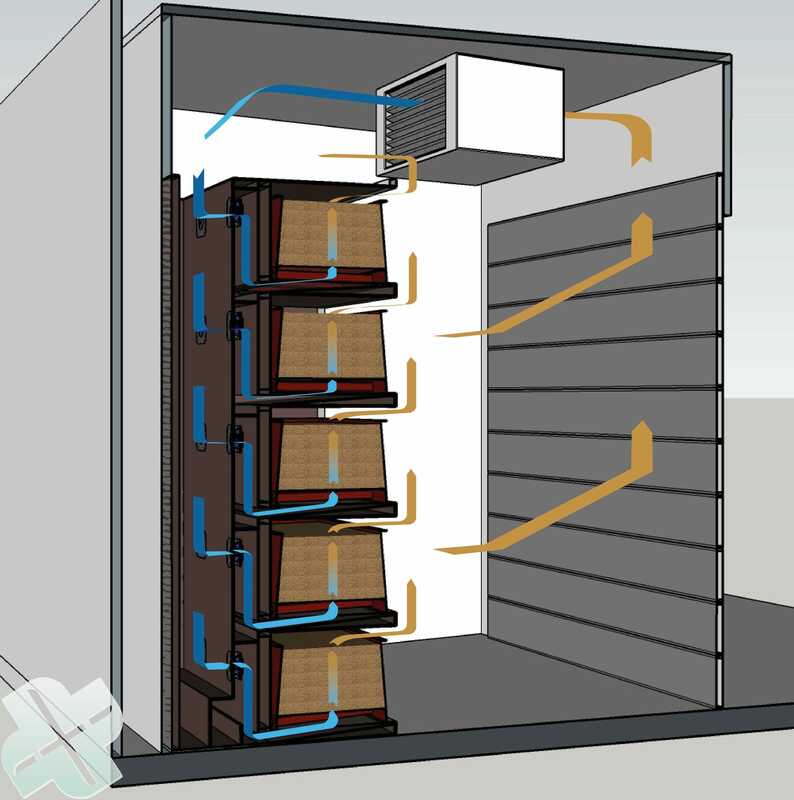 Besides humidification, the same installation can also be used for seed drying. The ventilation system will be produced with a valve to suction the outside air and heating to heat up the air. Ventilation system with humidifier and drying option. The ventilation system can be also be produced with equipment to humidify the seeds directly. All circulation air will be supplied with extra moisture. 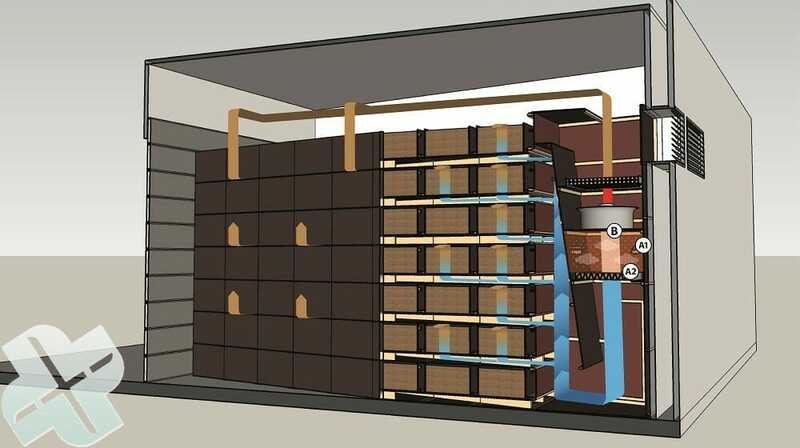 Ventilation system for humidification or drying. 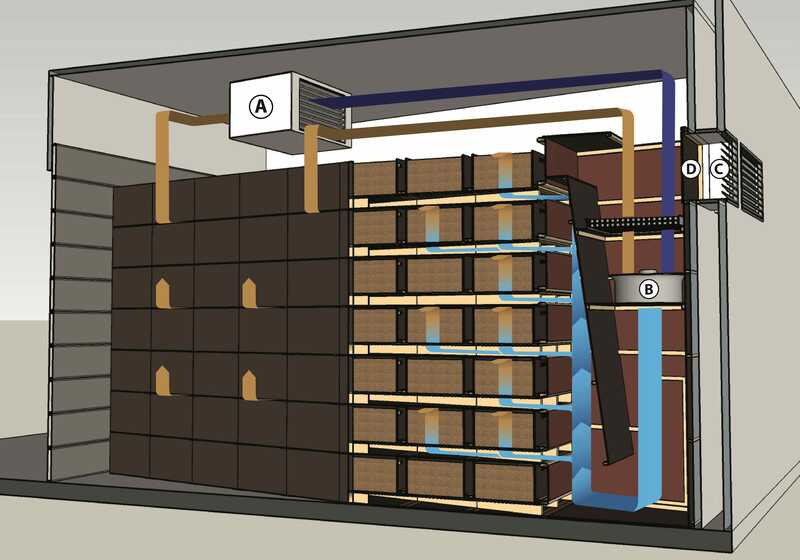 There are different options to utilize your existing boxes for humidification. This version is manufactured to client specifications. On the left an example with steel boxes, which are aerated individually. The humid air is suctioned on the rear side and circulates through the seeds.This process is also possible together with seed drying. Humidifier in closed cell circulation for individual boxes.